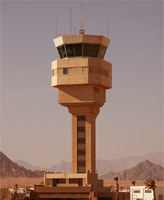 The Sharm El Sheikh airport, the second major airport in Egypt, meets all the requirements of the modern life. Nowadays there are two passenger terminals in the airport. Terminal 1 has been put into action in 2007 and serves for international flights. The terminal consists of two different levels separating incoming and outgoing passenger traffic. Terminal 2 serves for domestic flights. The third passenger terminal is planned to be deployed in 2012. It’s also in prospect to approach railway to the airport. Passengers arriving at the Sharm El Sheikh airport escape through the arriving area. International passengers pass through the passport control and customs supervision. Egypt entry permit can be obtained directly in the arrival area. Before departure it’s necessary to check-in at the departure hall. Checking-in starts 3 hours before the scheduled departure time and ends 1 hour before the departure. After checking-in the special supervision is necessary. Passport control and customs supervision is compulsory for the international passengers. For those who need to take some food there are several cafes, restaurants, fast food at the Sharm El Sheikh airport. Catering stations can be found in the air terminal and in the customs area as well. National and European dishes are served in the cafes and restaurants of the airport. Egyptian pound is the national currency of Egypt. 1 Egyptian pound consists of 100 piastres. Currency exchange is possible at the currency exchange offices and bank department inside the Terminal 1. There are also several 24-hour ATMs (cash terminals) at the airport. There are several pay phones for international calls in the passenger terminals of the airport. Wireless Internet access via Wi-Fi is also available. The Sharm El-Sheikh airport passenger terminals possess the widest shopping facilities including a great number of duty free shopping and souvenirs, retail outlets and bazaars. These are the places to spare time before take-off and to buy all the necessary things in. The departure customs area is famous for its duty-free shops offering local goods, foodstuffs, presents, perfumes, tobacco and alcohol. There are baggage packaging services at the Sharm El Sheikh airport departure area. The arrival area offers the passengers a cloakroom for their luggage to be stored for some time. There is also the missed baggage office in the arrival area where the lost luggage should be claimed for after the arrival to Sharm El Sheikh. The Sharm El-Sheikh airport is equipped with the service platforms for wheelchairs which gives the invalid persons wide opportunities for movement. Special service at departure or arrival requires beforehand notification of the servicing carrier. There are no special premises for business meetings and talks at the Sharm El-Sheikh airport. At the same time in a fifteen-minute drive from the airport there are numerous coastal hotels possessing various chambers and conference rooms equipped with all necessary facilities. There is no hotel at the Sharm El-Sheikh airport. The arrivals are welcome at the hotels in the resort area located not far from the airport. In the Sharm El-Sheikh airport arrival area there are rent-a-car services of Hertz and Thrifty international companies. On-line reserving and prepay of a car is possible. There are also local rent-a-car companies offering their services in the airport. There is a vast protected parking zone for passenger cars in front of the Sharm El-Sheikh airport Terminal 1. It's possible to leave the car both for short-time parking and for long-time parking.